Cut the pumpkins in half. Remove and rinse seeds. Rub some butter and salt on the pumpkin halves and roast until tender, about 45 minutes. Meanwhile, dry the seeds and mix them with a small amount of melted butter. Add a pinch of salt and curry powder and roast them about 15 minutes until crunchy. Blend the pumpkin till smooth with a few splashes of milk. Add the curry powder to taste, nutmeg, eggs, and sugar and mix well. I highly suggest using this homemade curry powder curry powder recipe , but feel free to buy some at the store! Chop the onions and finely dice the ginger, garlic, and chiles. Set aside about a teaspoon of onion and a pinch of the garlic for later. Saute the onions in oil until fairly browned. Add the ginger, garlic, and chiles, cook 1 minute. Add the beef and cook until browned. If you buy lean beef, there wont be much fat, but if there is visible fat in the pan, drain it. Time to build the pie! Lay out the bottom pie crust. Add the beef. There might be a little extra beef, so if it fills the pie too much, just leave some out. Next pour in the pumpkin. If you want a little extra flourish, cut the extra pie crust into a jack-o-lantern shape and place it onto the pie! This is the second post in our Pumpkin Series this week. This pie features the unexpected -- it's not a dessert! Read on to see exactly what it is, and check back for more pumpkin recipes to come! This is one of the most completely ridiculous meals I have ever made, and I am so glad to share it with you all here on tablespoon!!! Why is it so ridiculous? As you may know from my past posts on tablespoon, I like to combine 2 dishes into one meal. Well today, I am sort of combining 3 meals, and one of them happens to be a dessert! The results? Awesome! This meal started from the thought that cinnamon and nutmeg are common in pumpkin pie, and also curry. Next I had the idea to add a little extra spice to make the pie savory. I wanted to add meat somehow but couldn't figure out where it would go. The first idea was shreddy meat chunks, but my final inspiration came from another pie... shephards pie! Ground beef on the bottom, and pumpkin would replace the potatoes on top! 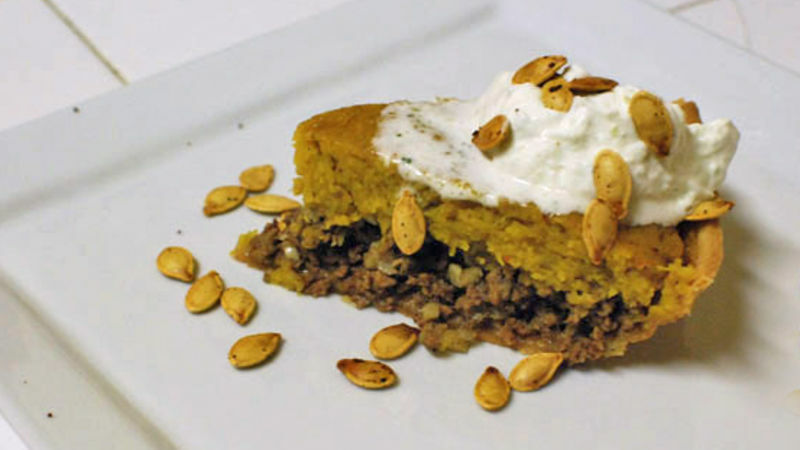 Wrap it all in a pie crust and you have a killer meal: Savory Pumpkin Pie. You know I had to use real pumpkin for this one! Feel free to grab a few cans though if you prefer. Onion, garlic, chile, and ginger go in with the ground beef. Eggs, sugar, and the curry spice in with the pumpkin. Yes, I also think the pumpkin looks like a crazy old man with a sugar beard. Don't worry. You aren't seeing things. Refrigerated pie crust was a huge time saver on this meal. The jack o lantern has a face like "there is something in here that will surprise you..." and that thing is meat! Pumpkin pie isn't complete without whipped cream! I made mine with the flavors of indian raita. Sprinkled with the toasted pumpkin seeds. Tasty! Dan Whalen is a blogger at The Food in my Beard; check Dan's Tablespoon profile often to try his recipes with creative international spins!